Almost all the holiday homes at Barlochan are privately owned. Our own double glazed and centrally heated caravans are available for let and offer weekly and short break bookings. The park welcomes tourers, motorhomes and tents. For campers who want extra comfort we have heated glamping pods sleeping up to four which come complete with fridge, microwave and electric kettle. At Barlochan you can simply relax, take in the views and enjoy the many activities the park has to offer in its beautifully landscaped grounds. These include an outdoor heated pool with picnic area, pitch and putt, games and TV room and coarse fishing on our nearby Barwhanny Loch. The local pub in Palnackie is only a short walk away and Dalbeattie Forest with its miles of fantastic walking trails, wildlife and 7 Stanes mountain bike trails is nearby. Barlochan is also an ideal base for exploring the region. Castle Douglas is known as Scotland’s Food Town and has lots of independently owned and award winning specialist shops. Along the coast excellent sailing facilities can be found at Kippford and there is a spectacular walk from Rockcliffe to the popular beach at Sandyhills Bay. You are also ideally located for visiting the beautiful Threave Gardens and Threave Castle (ring the bell for the boatman to take you across to visit the magnificent 12th centuary ruined tower), the RSPB reserve at Mersehead, Glen Urr Farm dairy ice cream centre or Mabie Farm Park near Dumfries. But perhaps the favourite for the children is the Cocoa Bean Chocolate Factory near the fishing port and artists town of Kirkcudbright. With quiet roads and plenty to see and do, we hope you will enjoy your visit to Barlochan in Dumfries and Galloway. View from Barlochan towards Kippford and the coast. 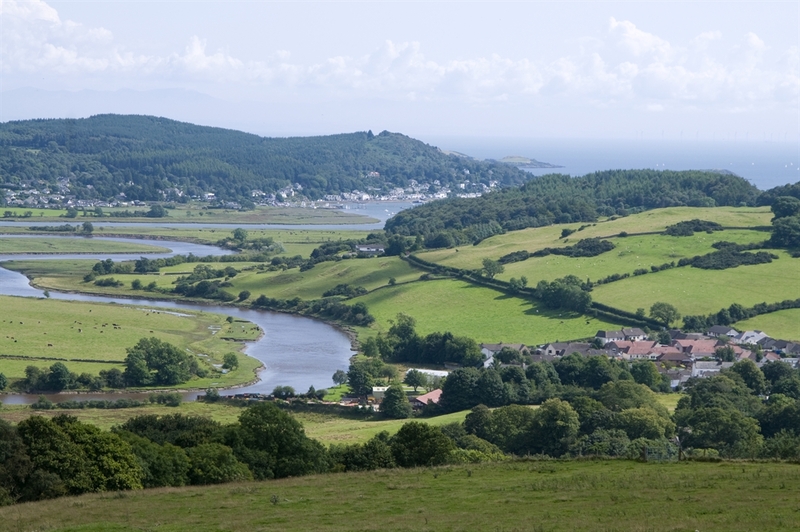 View from Barlochan towards Kippford and the coast.